I hadn't heard about this. Maybe since I've been sick since Christmas. Please click here to see what happened to Pope Benedict XVI. The lights still shine brightly on our Christmas tree, the creches in many areas of our homes are still standing and complete with all of the figuerines and with a bit of straw that I took home from the huge manger at our parish. Christmas cookies are wrapped on plates within easy reach, the egg nog still handy in the frig, and beautiful Christmas songs still play at our house. It's a sad sight to see Christmas trees that have been tossed out by the roadside just a day or two after Christmas by those not necessarily appreciating the meaning and the full extent of the season we are immersed in as Catholics and Christians. As we Catholics are lingering over Christmas, I thought I'd share a beautiful reflection from Mary Kochan, Senior Editor of Catholic Exchange. She wrote this at Christmas time. I Can’t Believe It’s Already Christmas! "Where did the year go?! "So many people have shared that sentiment with me in recent days. But this year I knew. I knew once the kids started school that the year was done – just turn around and blink and it would be Christmas. It wasn’t going to sneak up on me this year – and yet it did. As it always does. You can be going along praying the 2nd Joyful Mystery, and you think to yourself, 'Okay, now for the 3rd ,' and your heart leaps because the sudden joy of Christmas has snuck up on you once again. "Christmas, where time opens to eternity and our world is invaded by its own Maker, seems always to do something odd to our sense of time. St. Augustine was the philosopher who gave the great psychological account of time – that ungraspable present constantly passing into past. Past existing in our minds as memory, the future as expectation, and the present: the merest fleeting experience of now, now, now. "Christmas changes that -- changes our psychology of time. We are slingshot through Advent – pulled back and back and back through the ages to the very beginning of the beginning, where light was let to be, and man was let to be made and the very good world was crippled. We recapitulate the long longing ages of expectation. Anticipating what we already remember, we hear the promise whose very fulfillment has brought us to listen – to heed, to repent. And then we are arrested, by the now that never really becomes past, by the eternal moment of the Incarnation. "We stop before a stable; we peer in – dare we enter? No. But see, the Lady beckons, and so tentative, shy, we go forward. 'Behold,' she bids us, and emboldened, we do. And adore. "Yes, the year has flown, but we Catholics will linger over Christmas well into January. It is one of the gifts of our faith – a real Advent and a real Christmas Season. Speaking of gifts, I would like everyone of you to know what a gift you are to me. is, at heart, what we have to offer anyone and what the impoverished of life’s circumstances, or of spirit, most need. Donna-Marie Cooper O’Boyle, in her new book, “Mother Donna-Marie Cooper O’Boyle in her new book, “Mother Teresa and Me: Ten Years of Friendship,” shares lessons of personal action as well as spiritual growth she learned from a stellar guide, the Roman Catholic nun who forced the world to recognize its neglect of the poor and to do something about it. Mother Teresa, who was born in Macedonia of Albanian descent and entered the Sisters of Loreto, an Irish religious order that had missions in India, became a catalyst for change through the immediacy of her ministrations to the most wretched populations in the slums of Calcutta and then beyond. The results the author cites in her book are staggering: “…this humble but feisty and persistent woman established 610 foundations in 123 countries on every continent with nearly 4,000 sisters by the time of her death (in 1997, at age 87]. coworkers of the sick and suffering, and the lay Missionaries of Charity,” Ms. I hope you all had a beautiful Christmas yesterday. I was so busy yesterday that I didn't get a chance to post a message. My Christmas day began with a beautiful Mass on Christmas Eve and my Christmas day was filled with prayers, laughter, fun, conversation, sharing, cooking, baking, visiting with family and friends (over the phone too), hard work to get everything done, and collapsing at the end of the day in the living room, finally, to then top off the wonderful day playing a fun game with the family. I hope that your Christmas was holy, beautiful and memorable - creating memories for future generations! Imagine that! Coat a 9 x 13-inch baking pan with the nonstick spray and arrange the baguette slices in a single layer in the dish. In a large bowl, whisk together eggs, milk, three-fourths of the brown sugar, vanilla and nutmeg. Pour the mixture evenly over the bread. Cover and chill the mixture overnight. There will appear to be a lot of moisture when the mixture goes into the refrigerator, but it will all soak into the bread by morning. Just before baking, sprinkle the remaining one-quarter cup brown sugar, pecans and blueberries over the bread. Bake the dish in a 350 degree oven for 45 minutes to one hour (the recipe says 30 minutes, but I found that it takes longer, so check at 30 and be sure to have allowed for 45 minutes to 1 hour) or until golden and bubbling. Serve with maple syrup. For an added treat, heat the syrup with blueberries and have blueberry-flavored syrup. I love this recipe because you do the preparation beforehand and only need to pop in into the oven on Christmas morning 45 minutes to an hour before you'd like to serve it. I like to also serve fresh fruit with this "french toast," which can be washed and prepared on a dish in advance to save you the trouble on Christmas morning. I also like to serve fresh muffins - various kinds along with the fruit and "french toast." You may also use a whole grain type baguette in this recipe for added nutrition. You can put this dish in the oven Christmas morning, set the timer and go open your presents! So EASY - that's the idea - keep it simple and enjoy your loved ones! Lisa Hendey, founder of Catholic Mom.Com has posted the segment of me with Al Kresta speaking about some of my favorite books of the year (and an upcoming one!). Of course, in a short amount of time, I couldn't mention everything I may have liked to, but the cream of the crop came to my mind and I highly recommend them to you. You can listen to the short spot here. Jesus at the Post Office and the Christmas bread recipe! Here is a segment from a past Christmas segment in which I chat with Teresa Tomeo about meeting Jesus in the Post Office. Just click here to listen to it as well as some other Christmas reflections we talk about. I wonder who will win??? Check it out here. Here's the segment of Teresa Tomeo and I chatting this morning on "Catholic Connection." Pull up your chair and "join us." Just click here. If you get your orders to me asap meaning TODAY, I will send them out Priority mail to you today to receive in time for Christmas, God willing! Two gifts for me this morning and maybe for you too! Chatting with my dear friend Teresa Tomeo on Catholic Connection this morning and then off to visit another dear friend for a chat on the radio as well - Roxane Salonen! Just tune in this morning (Monday) at 9:15 AM Eastern Standard Time by clicking here at avemariaradio.net and then click "listen live." 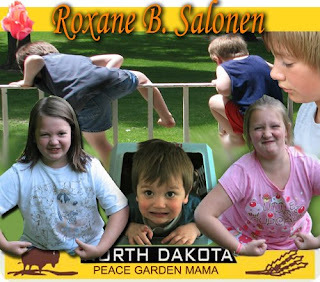 To learn more and see how to tune in to listen to Roxane and me, check out her post here. I hope you can join us! Take a look here to see what we were talking about on Al Kresta's show this evening. The interview of me by Lisa Hendey for Faith & Family Live is now up at the website. You can listen in by clicking here. 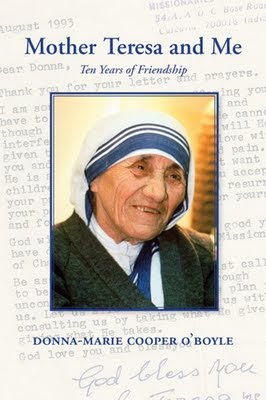 There's also a contest going on over there to win my book: Mother Teresa and Me: Ten Years of Friendship. Faith & Family Live Contest to win my book! Go on over to Faith & Family Live to see how you can win a copy of my newest book: Mother Teresa and Me: Ten Years of Friendship by clicking here. Also, very soon the podcast will be posted of Lisa Hendey interviewing me today about the book. Stay tuned or keep checking the Faith & Family website (link above) for the podcast. I hope you win a book! Go over and take a look to see how you can win. It's very easy but the deadline is fast approaching. Autographed copies of my new book are still available from my website: www.donnacooperoboyle.com and I will be including a Miraculous medal blessed by Pope Benedict while I was in Rome recently while supplies last. I am doing my very best to fill all orders and get them right out so you may have them in time for Christmas, God willing! Sarah has something over at her blog about my new book. Join me tomorrow (Friday) on Sacred Heart Radio with Brian Patrick. I'll be chatting with him at 8:50 AM Eastern time. You can tune in here. Just click on the "listen online" button at the top of the page. We'll be talking about my new book: Mother Teresa and Me: Ten Years of Friendship. I thought I'd post one of my photos from my recent trip to Rome just for the fun of it. 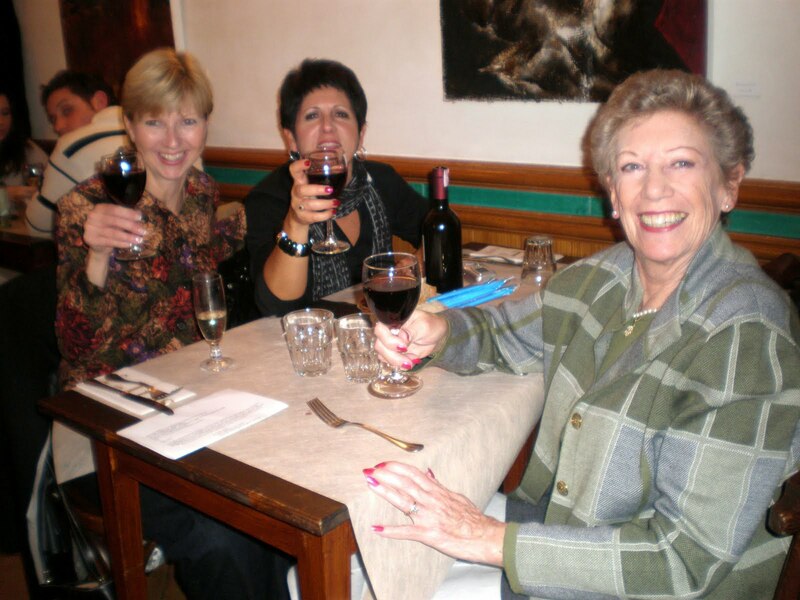 :) Here's a photo of my dear friend Teresa Tomeo with me and our new friend who we hung out with and spent some very special time with while in Rome, Joanne Ford. 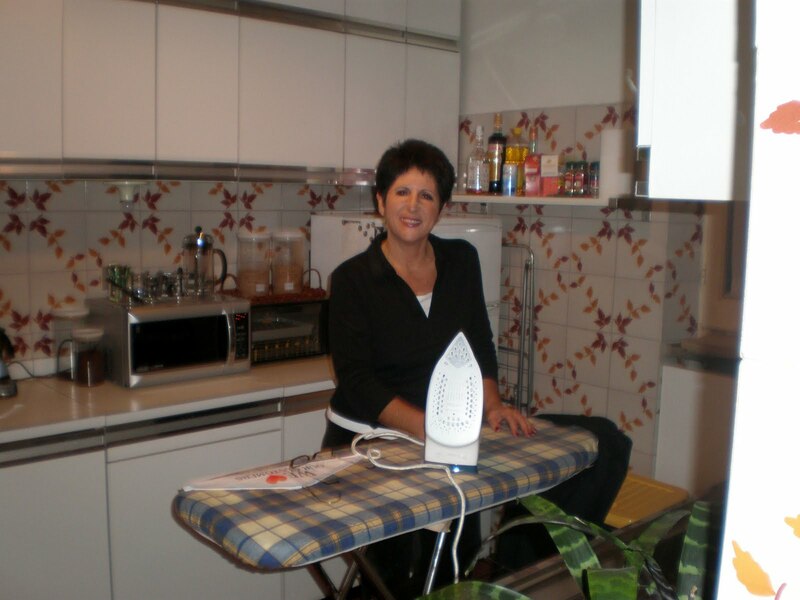 Joanne writes for L'Osservatore Romano, the Vatican newspaper and takes classes at the Angelicum. I'll continue my story about Rome at some point in the near future. Right now, I am focusing on Advent, Christmas coming up and my new book just released: Mother Teresa and Me: Ten Years of Friendship. This morning (on Thursday, December 17th), I will be a guest on Gus Lloyd's show: Seize the Day!. We'll be chatting about my new book. This show will be LIVE. You can tune in at 9:35 AM Eastern time. I won't have a link to give you to listen in until the end of December in case you can't tune to this morning. Also today, at I will be doing a chat with a dear friend, Lisa Hendey who will be interviewing me for a Faith & Family podcast. I will let you know when it will air or you can check later on today on the Faith & Family Live website (link in my blog roll on the left hand column of this blog). An author’s relationship with Blessed Mother Teresa taught her much about sanctity of everyday life. Meeting Mother Teresa is something most Catholics would have considered an incredible honor and a blessing. But Donna-Marie Cooper O’Boyle, a U.S. author, blogger and retreat director, through a turn of providence spent years in friendship and spiritual direction with her. In her new book, “Mother Teresa and Me: Ten Years of Friendship” (Circle Press, $14.95), Cooper O’Boyle offers a close-up look at Mother Teresa, her work, and a side of her that few people knew. Cooper O’Boyle, author of “Catholic Prayer Book for Mothers” (OSV, $6.95) and “Grace Café: Serving Up Recipes for Faithful Mothering” (Circle, $14.95), recently spoke with OSV about her friendship with Blessed Teresa, which was built on one phone call, a dozen meetings and 22 letters from the saint of Calcutta. Our Sunday Visitor: I love the scene in your book where you’re not expecting to meet Mother Teresa, and then there she is with you at Mass. I think you capture how any one of us might feel if we realized a living saint was in such close proximity. But what happens later is almost too good to be true. What was it like? Donna-Marie Cooper O’Boyle: She walked right past me, and I almost couldn’t believe it. The feeling was a combination of almost disbelief, a peace that filled my soul and ecstatic joy. I could never have imagined that we would have any exchanges with Mother Teresa in any way. First was the beautiful warm hug that she gave [my daughter] Chaldea, and then, after Mass, she came directly to me and asked me about my littlest one, Jessica. I was astounded and at the same time overcome with incredible peace to have her so near. I had no doubt that she was a saint. OSV: How did you go from that moment in Washington to a correspondence and then friendship? Cooper O’Boyle: After we left the convent and headed home to Connecticut, I pondered all of the blessings. I wanted to write Mother Teresa a letter of thanks, but I didn’t want to take up her time. So, I contacted the mother superior when I got home to ask her. She told me to go ahead, and I took that as God’s message to me. That’s how the correspondence started. OSV: Another one of my favorite scenes is when you are in Harlem (in New York) preparing a meal for the homeless. I love the moment when you are peeling a bruised pear, keeping the good parts, and a Missionary of Charity hands you back the piece you had discarded, signaling there was more that you could salvage. That scene seems like it took you out of your comfort zone. How did the relationship affect your day-to-day life? How did it change you? Cooper O’Boyle: Yes, I love that moment too. It was so profound, yet so simple. I realized how much the sisters relied on Divine Providence for everything and would never waste even a crumb or a portion of anything. My relationship with Mother Teresa impacted my daily life in that I was striving to live the Gospel message as she did — but in my own walk of life. I became a lay Missionary of Charity and encouraged others to do so as well. I was striving for a deeper holiness still. How did my relationship with Mother Teresa change me? I think by calling me to an even deeper relationship with God. By keeping me on task, if you will. OSV: Most of us think of Mother Teresa with a sense of awe. To imagine her taking the time to talk with and write to a mom here in the United States tells us a lot about her. Cooper O’Boyle: She believed totally in the one by one by one, which is how I try to live my life. Each person that you encounter, everything that happens, there are no coincidences. Whoever God has put you with, that’s where you work out your salvation. He sanctifies those moments of interaction and exchanges, depending on how we respond. Do we respond in love? Through prayer and love. I feel that that’s where the sanctification happens. Mother Teresa, she dealt with each person as they came. These people that God put into her life, she treated as Jesus in the distressing disguises of the poorest of the poor. She loved each one as Jesus, and that’s where all the amazing transformations happen. 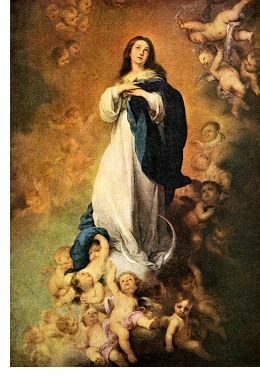 OSV: What is the greatest lesson you learned from her? Cooper O’Boyle: That’s hard to put into words. But I think the most important ones are to love, to respond in love and to treat everyone as Jesus. The greatest lesson is to love. Son of God and of man. ~St. John of the Cross "The Incarnation"
Elena Maria Vidal has interviewed me about my work an my newest book which is very dear to my heart: Mother Teresa and Me: Ten Years of Friendship. You can see the interview here. I'd like to take a moment to let you know when you can expect to listen to some radio interviews coming up about Christmas and also my new book: Mother Teresa and Me: Ten Years of Friendship. On Thursday, December 17th, I will be a guest on Gus Lloyd's show: Seize the Day!. We'll be chatting about my new book. This show will be LIVE. You can tune in at 9:35 AM Eastern time. On the same day, the 17th at 2:00 PM, I will be doing a chat with a dear friend, Lisa Hendey when she will be interviewing me for a Faith & Family podcast. I will furnish more details when I have them. Then, that week end I will be doing some book signings. One will be at Borders in Danbury, CT at 3:00 PM Eastern on Saturday, the 19th. Directly afterward, I will be signing after the 5:00 PM Mass at St. Francis Xavier Church, Route 109 in New Milford, CT. The next morning, Sunday, December 20th, I will be signing my new books (and I will bring all of them with me) after the 7:30 AM (Eastern) Mass, after the 10:00 AM Mass and then later that evening after the 5:00 PM Mass. A couple of days later on Monday, December 21st, I will be on Catholic Connection with my dear friend, Teresa Tomeo at 9:15 AM Eastern time on our "Mom's Corner" segment talking about this holy season and my new book. You can tune in here to the LIVE show and click the "listen live" button on the top of the screen. A little bit later on the same day, Monday the 21st, at 11:30 AM Eastern time, I will be a guest on a radio show with another dear friend, Roxane Salonen. The information for this show can be found here. I'll also try my best to post links to the segments in case you don't get a chance to tune in at the times of the shows. If you have a little time to listen in, here are two previous interviews about my Mother Teresa book that has just been released. Here's a link to my interview on a "Morning Air" segment in which I spoke all about Mother Teresa and Me: Ten Years of Friendship. Just click here to listen! In case you didn't get a chance to tune in to my segment with my dear friend, Teresa Tomeo on our "Mom's Corner" segment, you can listen right now. Just grab a drink, pull up a chair and click here! Teresa and I were chatting about my friendship with Blessed Mother Teresa and my new book about her: Mother Teresa and Me: Ten Years of Friendship. Additionally, I will soon post the dates and times of my new radio interviews coming up. "Five centuries ago, in the country now known as Mexico, senseless human sacrifices were performed. Between 20,000 and 50,000 human beings were murdered a year in the Aztec empire. Most of them were slaves and included men, as well as women, and children. An early Mexican historian estimated that one out of every five children in Mexico was sacrificed to the gods. The climax of these ritualistic killings came in 1487 when a new temple (ornately decorated with snakes) was dedicated in what is now modern day Mexico City. In a single ceremony that lasted four days and four nights, accompanied by the constant beating of giant drums made of snakeskin, the Aztec ruler and demon worshiper Tlacaellel presided over the sacrifice of more than 80,000 men. 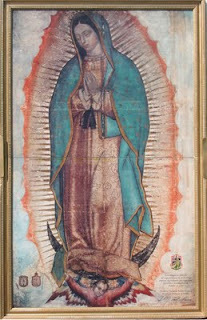 It was Our Lady of Guadalupe who crushed the head of the wicked serpent in 1531. For, it was then that she appeared to a poor, humble, uneducated man, Juan Diego. In bare feet, he walked every Saturday and Sunday to church, departing before dawn, to be on time for Mass and religious instruction. It is my honor to be published in the L'Osservatore Romano this week AND to be able to spread the word about my dear friend and colleague Teresa Tomeo's All Things Girl series of books for young girls. Talk show host with EWTN/Ave Maria Radio, Teresa Tomeo, teamed up with Molly Miller and Monica Cops, who put their heads and hearts together to come up with a breath of fresh air for today's young girls, in the form of a series of books called “All Things Girl”. The following is a review of two of the books in the series by Donna-Marie Cooper O'Boyle, EWTN TV host and author of several Catholic books. Donna-Marie and Teresa participated in the International Congress for Women held at the Vatican in February 2008. You can see the review here in the Vatican newspaper. This is an interesting idea! I received it in an email today. friends. What do you have to lose but 44 cents, what do you have to gain more than you will ever know. Want to have some fun this CHRISTMAS? Send the ACLU a CHRISTMAS CARD this year. As they are working so very hard to get rid of the CHRISTMAS part of this holiday, we shouldall send them a nice, CHRISTIAN card to brighten up their dark, sad, little world. Make sure it says "Merry Christmas" on it. Two tons of Christmas cards would freeze their operations because they wouldn't know if any were regular mail containing contributions. So spend 44 cents and tell the ACLU to leave Christmas alone. Also tell them that there is no such thing as a "Holiday tree". It's always been called a CHRISTMAS TREE! And pass this on to your email lists. We really want to communicate with the ACLU! For those of you who aren't aware of them, the ACLU, (the American Civil Liberties Union) is the one suing the U.S. Government to take God, Christmas or anything Christian away from us. They represent the atheists and others in this war. Help put Christ back in Christmas! 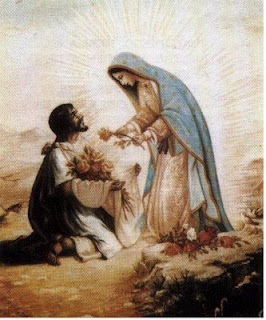 Go on over to my "Moments of Inspiration With Your Favorite Saints" to read a reflection on St. Juan Diego. She begins: "Mother Teresa and Me, the first-hand account of Donna-Marie Cooper O'Boyle about her ten year friendship with the Saint of the Gutters, is a deceptively slender volume, deceptive in that it is truly a powerhouse of a book. Every page is rich with spiritual insights, simple yet profound, in the manner of Saint Thérèse of Lisieux. Although I have heard and read of Mother Teresa from the time I was a child she has never come fully alive for me until now, for through the book I feel that I have met her. The author deftly communicates her own experiences to the reader, from the time she first encounters Mother Teresa after Mass while visiting with the late Fr. John Hardon, to to the transformation of her spiritual life and those of others through her long correspondence and further meetings with the saint. Most of all it recalls to mind that the world is unaware of the suffering and starvation, both material and spiritual, that goes on everywhere. Lazarus still begs at the gate. I read a beautiful testament to Catholic marriage last night and wish to share it here. It's from author and OSV writer and editor Mary de Turris Poust. She begins: "This morning I got up and hung a little sign on the window over my kitchen sink. It says: “Make a decision to love.” I taped one to the bathroom mirror and over my desk as well. What’s with the cryptic notes? They’re part of my re-entry into the real world after experiencing an eye-opening and life-changing Marriage Encounter (ME) weekend with Dennis. This was our first ME experience, after years of hemming and hawing about whether we should go. I’d often suggest it, but we would always come up with a laundry list of excuses as to why it wasn’t possible. Mainly, how could we go away for an entire weekend when we couldn’t find a sitter for two hours on a Friday night? Today is the book release day! Today is THE DAY! 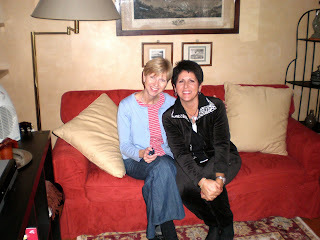 Mother Teresa and Me: Ten Years of Friendship will be released and shipped all over. I'll be getting my copies later this week so I can then send them out to all of you who have pre-ordered! You may place an order through my website: www.donnacooperoboyle.com (and scroll to the bottom of the main page) if you haven't already ordered. That's the very quickest way to get your autographed copies for Christmas gift-giving. I'll be posting links throughout the day pertaining to my book release. Stay tuned. One is this link to a podcast I did with Pat at Among Women. I speak about my friendship with Mother Teresa and my book. I'll post one I did with Teresa Tomeo as well as some other information. The Mother Teresa archivist has requested several copies of my book for their archives as well as articles I have written about her. They want the information to be available to future generations. I pray that my book will help to inspire! I am looking forward to writing about the Memorial Mass for Archbishop Fulton Sheen next week at St. Patrick's Cathedral in NYC. I tidbit of his wisdom..."There are many who excuse themselves, saying that if they were in other circumstances they would be much more patient. This is a grave mistake, for it assumes that virtue is a matter of geography, and not of moral effort. It makes little difference where we are; it all depends on what we are thinking about." I often write about or speak about that very thing! Well, it's no longer just an inspiration, no longer just a manuscript, no longer just a promise of publishing, it's HERE right beside me as I type: "Mother Teresa and Me: Ten Years of Friendship"!! My advance copy just arrived. :) God is so good! I pray it will inspire. This was the direct signal from God telling me that I had to get my book published. Numerous publishers had been reluctant to touch it. Discouraged, by negative comments, I was ready to give up and just post the text on my website. “Men don’t read,” they had said. “Our editors found your book too controversial.” More than one publisher’s rep wondered what priests knew about married life anyway. Comments like these figured in the rejection notices accompanying the returned manuscripts. So, why did I write a book for men about marriage? What credibility could I establish? What qualified me, a priest to speak on this subject?..." Check out this article at Catholic Exchange by Fr. James, whose book I promoted yesterday. To keep us on track with our Christmas novena click here. "Man to Man" is now released! I am very happy to announce that my friend, Fr. James Farfaglia has just released his first book: Man to Man. It's only been out about a week and it is already selling off the shelves. What does this tell us? That men want to know how to act like and actually how to BE a man - a real man! Don't you think? I hope that Catholic wives and engaged women will get a copy of this book for their husbands and their betrothed. Donna-Marie: Fr. James, can you kindly tell us why you decided to write this book? Fr. James: There is a deep crisis within manhood that needs to be addressed in a very practical and straightforward manner. Men need to be encouraged to be faithful and heroic. Also, many women are frustrated in their married life because their husbands do not always understand a number of things, such as, the emotional needs of their wives; their leadership role within the family or how to be manly but at the same time how to be tender and kind. Within the intimate life of husband and wife, many men simply do not understand the emotional world of women and how to enter into that world. At the same time, many wives do not understand the emotional world of their husbands and how to enter into that world. Many married couples do not understand that their intimate sexual life is a vehicle by which they experience the God of unconditional love. Through the teachings of John Paul II's Theology of the Body, the Church needs to address these issues in a very practical, straightforward, and direct manner. Donna-Marie: What are your hopes for your elementary school? I hear that you have special plans for this book. Fr. James: I am a firm believer in well-run Catholics schools that are faithful to the Magisterium of the Catholic Church. I went to St. Mary's elementary school in Ridgefield, CT. and I am part of the founding class of Magdalen College of Warner, NH. I know, first hand, the impact that a serious Catholic education can have on a child or a young person. I am the pastor of the newest Catholic parish in the city of Corpus Christi, TX. Our parish is a little more than 5 years old. 90% of the baptized Catholics within my parish boundaries do not go to church anywhere. Moreover, they are not remotely interested. I know this, because we are visiting our homes like Mormons and Jehovah Witnesses. A school will get the parents re-involved in the Catholic Church. A well-run Catholic school is the best means of evangelization that the Catholic Church has to offer. A parish is essential, but it needs the school. The school is the heart of the parish. It provides the blood. Close the school and the parish dies. Donna-Marie: I think it's great that you are using the proceeds of this book to help build your school. Thank you very much for this short interview, Fr. James. I am looking forward to a more in depth interview with you very soon. "Father James Farfaglia is the Pastor of St. Helena of the True Cross of Jesus Catholic Church in Corpus Christi, Texas. Originally from Ridgefield, CT., Father has founded and developed apostolates for the Catholic Church in Spain, Italy, Mexico, Canada and throughout the United States. Father James is known for his orthodoxy, his unconditional obedience to the Pope, his delicate fidelity to all liturgical norms, his love for real sacred music, his well prepared homilies, and his unwavering pro-life stand." Now a little bit about his book: Man to Man. Check out the website here. I have personally read the manuscript and have endorsed this book. My words on the back cover are: "Man to Man couldn't have come at a better time for today's men who are confronted with a myriad of mixed messages regarding their manhood or lack thereof. With eyes wide open to the dangers lurking in today's culture, Fr. James Farfaglia takes a brutally honest approach to discussions of love, marriage, sexuality and family life sure to capture a mans attention. The author urgently invites all men: husbands and fathers to accept the loving heroic role that God has created them for. Man to Man should be on every book shelf. Better yet, in every mans hands. " Here's a review by Jennifer Hartline. From Fr. James about his book: "Heroic men have always inspired me. Saints, military generals, and famous presidents have always provided light and direction during my life. Men like Paul, Athanasius, Thomas Moore, John Fisher, Edmond Campion, John Vianney, Miguel Pro, Oscar Romero, John Paul II, Pope Benedict, Washington, Lincoln, Reagan, Patton, MacArthur and Eisenhower are all men that I admire very much. They are all lighthouses: men, who within their own historical circumstances, stood up to the plate and lived their lives with heroism. I know that as married men you are challenged every day. I am writing to you in order to encourage you to remain faithful and to be a hero. I am writing this book for you, man to man, with deep love and concern so that you will be happy in this life and eternally happy in the life to come. One Sunday night in December 2006, I awoke at 3:00 AM and quickly wrote out the titles of the chapters of this book. I have never experienced this kind of inspiration before. The desire to write the book was something that kept bothering me for the next couple of weeks. So, I decided that God was telling me something and perhaps using me. I quickly decided to take some time off and write the book. I knew that I had to get away from the parish and I also knew that I needed a quiet, peaceful place that would help inspire my reflections. I have never used vacation time to write, but I thought, why not? So, here I am, on a small island off the coast of the Yucatan Peninsula, writing to you, the heroes of the modern world. The book that you are about to read is very practical and down to earth." "It’s time once again for the Advent procession. Time to get out the figurines of the Nativity set and let the children move them about the house. From room to room and shelf to shelf the Wise Men process on their journey that will end on Epiphany, while Joseph and Mary, by a different route, will be carried to the same Christmas Eve destination. 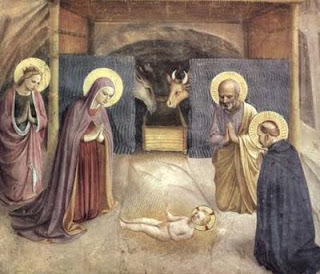 On that night, we will celebrate the Gift of all Gifts, but now while righteous Joseph leads the Virgin Mother toward the manger — not his choice of maternity lodging! — and while they both are carried (more or less delicately) from place to place, it is a good time to think about what a gift the man Joseph himself was, and is. I'm over at Peace Garden Mama's today! I am over at Peace Garden Mama today too! Roxane has posted an interview of me. Mother Teresa and Me at Catholic Mom.Com! 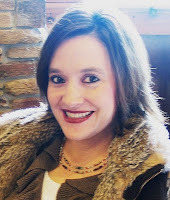 Take a look over at Catholic Mom.Com to see what Lisa Hendey has said about my upcoming book. I've been telling you that I would post about my trip here and then I came back from Rome to four birthday celebrations - 3 of my kids' and mine too, as well as Thanksgiving to boot! Needless to say, I was very busy. Now, I will finally fill you in a bit. 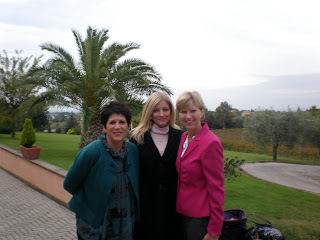 Teresa Tomeo and I were invited to an evangelization summit held in Rome near the Vatican. 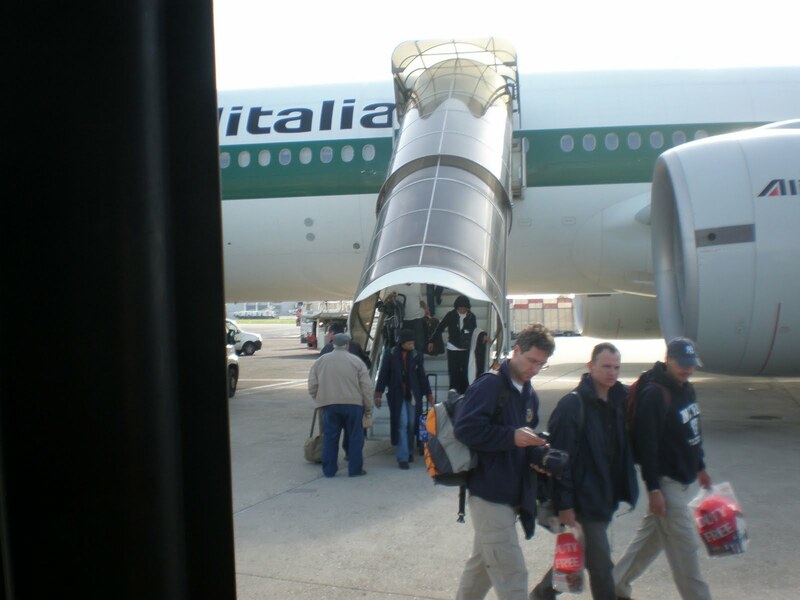 We both traveled on November 11th and arrived in Rome by separate flights on November 12th. I didn't sleep a wink on my flight because I was surrounded with very loud people who didn't think a night flight was for sleeping. In addition, I can never really get any sleep in a tight little spot anyway. 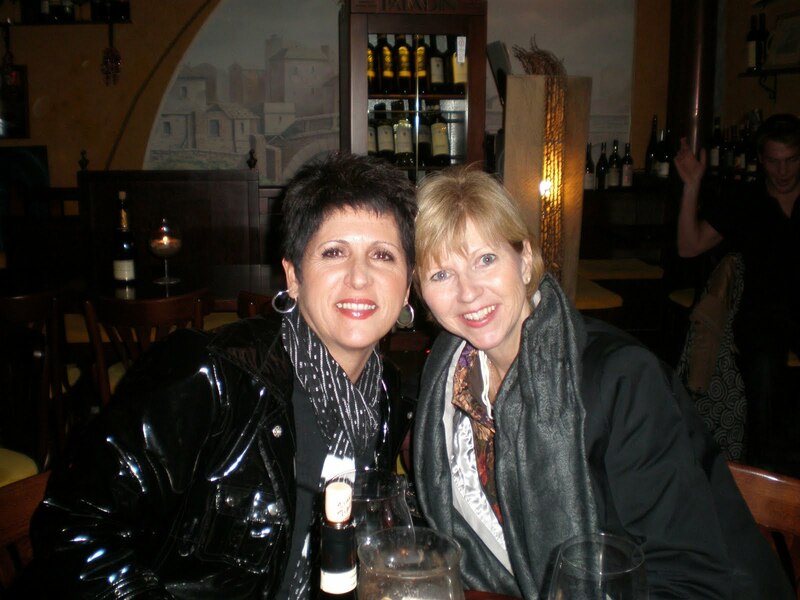 Nevertheless, I was very excited that I would be meeting up with my dear friend Teresa at the airport. We found one another and our gracious driver, Alfredo, who then kindly took us to the apartment where we would be staying. 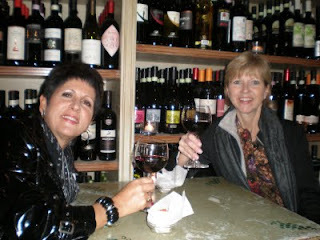 Here are the two of us - Lucy and Ethel as we are sometimes referred to. Don't look too close at me - this is after no sleep the night before on the plane and I mean zero sleep and then the journey to the apartment. We were so glad to have the opportunity to be together and experience the upcoming summit together too. Is God good, or what? We felt incredibly blessed and thanked God right there on the spot. Alfredo did the honors of snapping the photo. This is what we were greeted with when we walked into the very cute living room and dining room of our apartment - goodies for us, lovingly placed there by some sweet person. 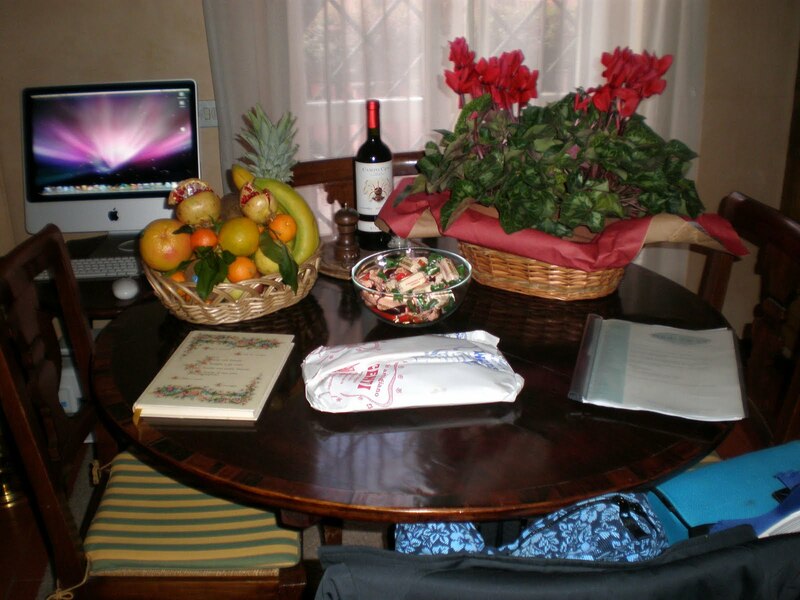 Cookies, flowers, fruit, wine - how wonderful! Rome, ahh, Rome sweet Rome! What a great start to an amazing trip! 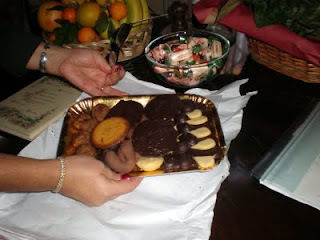 Speaking of cookies...yep - they were delicious! Oh, that's right! 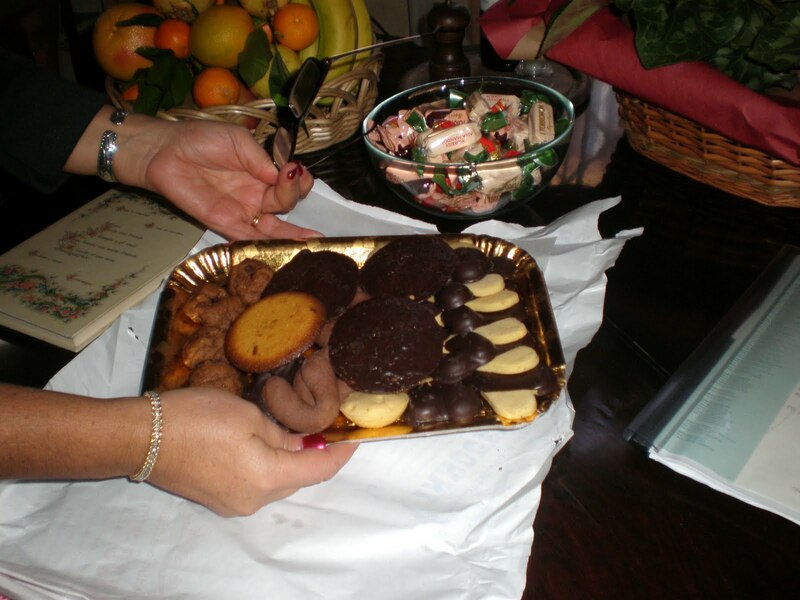 Italian candies too! After we took showers to try and wash away some of the sleepiness with hopes of getting some sort of second-wind, Teresa and I stepped out on the town! We looked all over and relished in the sheer beauty that we see in Rome. Oh, I must pause here and back up a bit to mention that when we got out of the car at our apartment when we first arrived, Teresa looked up at the blue sky and exclaimed out loud with her arms outstretched to the sky, something like, "The sky is even so much prettier in ROME!!!" And as soon as the words were out of her mouth, a voice coming from an apartment window above exclaimed, "Stai zitti!!!" That means, "Shut up!!" We laughed. "We're here!" we mused. "Watch out Rome!!" First we walked up to a nearby church called St. Cecelia's As I posted a little earlier on this blog on the feast of St. Cecelia, "It was a very beautiful church and we spent some time there. I was most struck by a man who was pushing a broom, cleaning up the courtyard just outside the door. We stopped to talk with him and ask a few questions about St. Cecilia. I had remembered that I had read something about her recently and I wanted a find out more. The man stood there, leaning on his broom - his eyes gleaming as he told us the story he knew. We felt blessed to hear from this seemingly simple man who appeared to us to have a deep faith. The photo here is one I took of the altar in St. Cecilia's church. Her relics are below the altar." 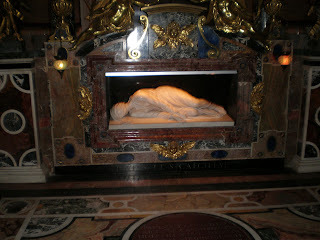 I couldn't wait to get to St. Peter's. That wouldn't be soon enough for me. We came upon a neat little place that Teresa recognized from a previous trip, went in and enjoyed a glass of wine together. Ah, dear friends together! 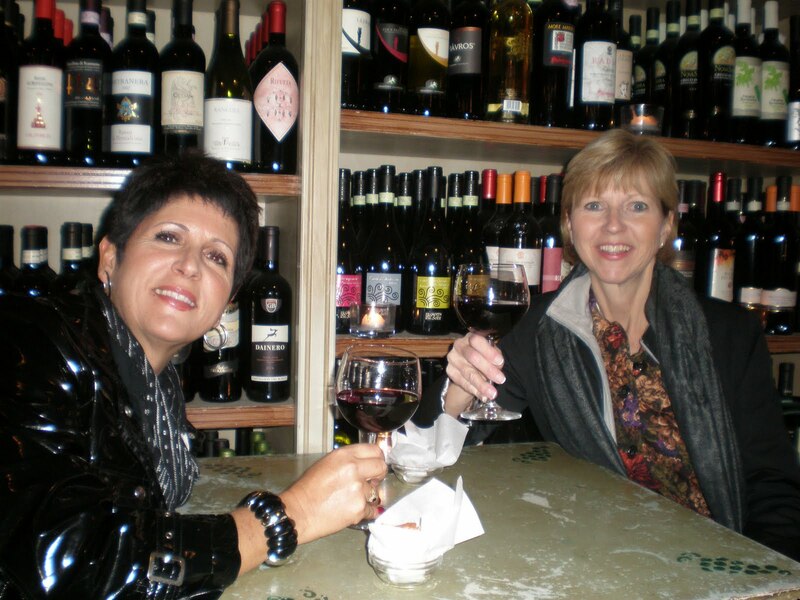 What another glass of wine at another quaint little place? Well, we were just sipping, and lots of time had passed as we walked around, partly in a sleep deprived daze (at least I was) and partly just in awe of where we were, and we took it all in, thanking God all along the way. We finally met up with our dear dear friend, Joan Lewis who is EWTN's News Bureau Chief for the Vatican. We sat down at a favorite restaurant and relished in one another's company. Yes, of course, we had to sip at another glass of that fine Italian wine and eat that scrumptious food cooked to perfection, mingled with amazing conversation and topped off with Limoncello. We remarked that if cameras were rolling or recording equipment, we could have had about 5 episodes worth of material based on the many wonderful things we shared about our faith and the Church! Now, there's something funny about locks, keys and Lucy and me! It all started last year, almost 2 years ago, really in Rome. We seemed to have some trouble and that's why we nick-named ourselves Lucy and Ethel. Here's Teresa AKA Lucy attempting to turn the key in the lock to the outside door of our apartment for about the twentieth time. I was laughing so hard that I could hardly pull out my camera to document it! But, document, I did! I'm still recalling Alfredo's words of direction to us about the keys when we arrived - "this one turn this way and that one turn four times this way" - they are a bit tricky. Up the stairs and another key for our inside door. We finally get in and can't wait to flop on beds that looked oh, so inviting after no sleep for what seemed like forever. But who cared? We were in Rome. But, before bed, we had to get our clothes spiffy for our conference which we would be going to very bright and early in the morning. Don't you love the cute little kitchen? We looked forward to having sweet dreams, thankful for our safe arrival, a wonderful time together and with dear Joan and all that was in store for us at the summit the following day with the great line up of speakers and people that we looked forward to meeting.